The Medical Arts Building is sheathed in bright white terra cotta. “Terra cotta” translates from Latin as “baked earth,” and that’s exactly what it is. It’s made of finely milled clay that’s molded and fired at a thousand degrees Fahrenheit. The result is an extremely durable, weather-resistant material that has been used to protect the exteriors of buildings for thousands of years, or in this case, since the building’s 1923 construction. 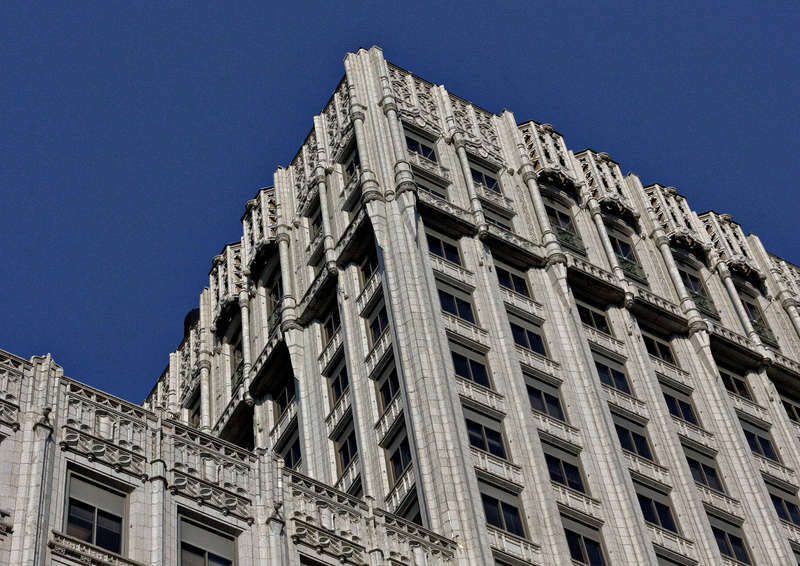 The style is Gothic Revival — in other words, reminiscent of 12th-century European Cathedrals, which are characterized by tall vertical shafts culminating in spikey finials. Architects Louis Long and Olaf Thorshov toned down the Gothic detail on the exterior as befits the building’s longstanding purpose: offices for medical professionals. 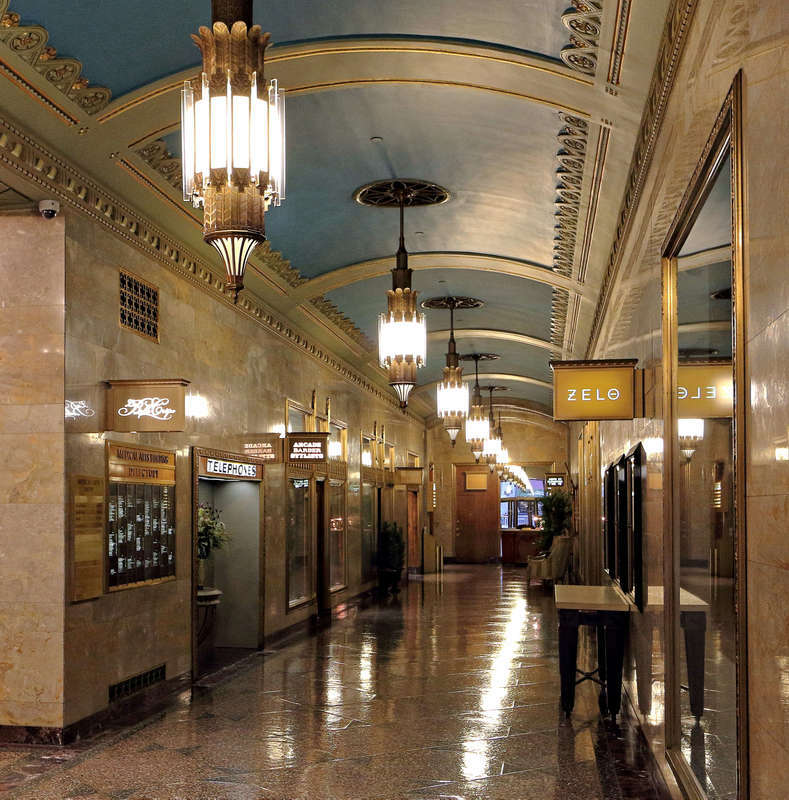 But the prim and proper exterior is balanced by an ornate lobby that features periwinkle blue coffered ceilings, monogrammed brass elevator doors, and rows of complex pendant lights. However, perhaps the most interesting — and curious — part of the building is a sign that appears to have survived all renovations and tenant changes. 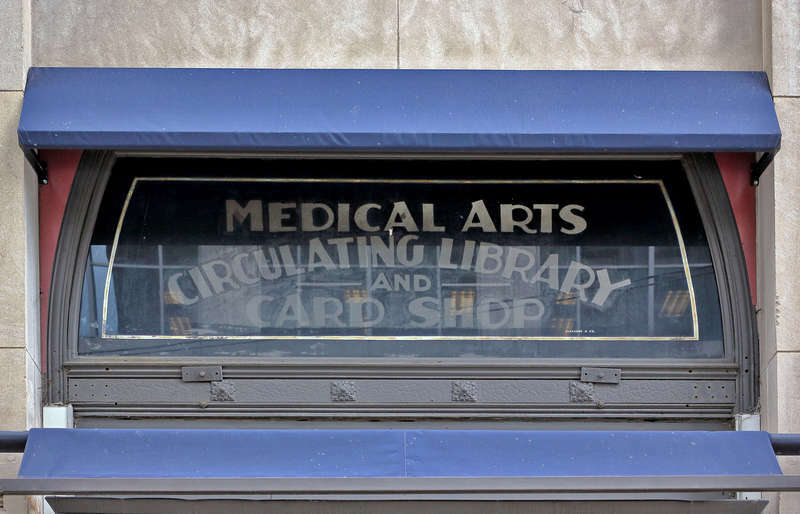 Painted on a small window above a narrow shop facing Nicollet, the sign says “Medical Arts Circulating Library and Card Shop.” Circulating library?! What sort of library books or other materials could have been available from this tiny shop? Unfortunately, the building isn’t talking (although the crêpier currently in the space might). 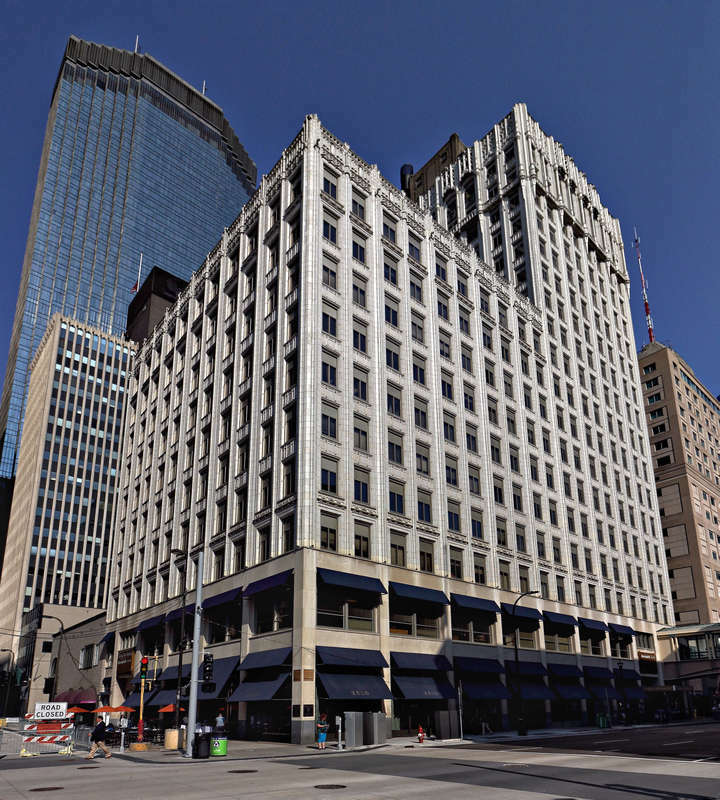 Richard L. Kronick & Lisa Middag, “Medical Arts Building,” Minneapolis Historical, accessed April 18, 2019, http://minneapolishistorical.org/items/show/167.